The largest species of abalone in the world. It is well suited for farming, both land based and ocean based operations. 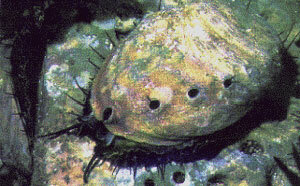 The red abalone also has one of the best meat to shell ratios of any of the meat abalone. Usually the epipodium is black, but it is not uncommon to find specimens with a barred black and cream color pattern. The surface of the epipodium is smooth and broadly scalloped along the edge. The area around the foot is black and the sole is tan to grey. Tentacles are black. The shell surface is generally brick red (color may be masked by encrusting organisms) and the inside edge is often red; there are 3-4 open pores, moderately elevated above the shell surface. Habitat: Intertidal zone and sub-tidally down to at least 100 feet. In the south, sub-tidal zone down to at least 100 feet. Comments: Size to at least 11.76 inches, commonly 6-8 inches. World's largest abalone. Most desirable commercially for size and light meat color. They may recolonize depleted areas more rapidly than other species. Object of mariculture around the globe. Farmed Red Abalone may grow up to four inches in four years.